Aytekin Tank of JotForm recounts two very opposite experiences dealing with management from his career, using them to highlight why it's critical for managers to practice "the middle way". It's the place between under-management and micromanagement that fosters the best work and maximum growth from a team. A solid read for anyone that is in a management seat and struggles at times to find the right level on which to operate. Rajiv Pant of The Wall Street Journal explains that to be an effective CTO you need to focus on a different CTO: culture, technology, and operations. Learn the critical components of each category as well as 5 key lessons he's learned from his experience. This is a great read for current CTOs or those with aspirations to become one. 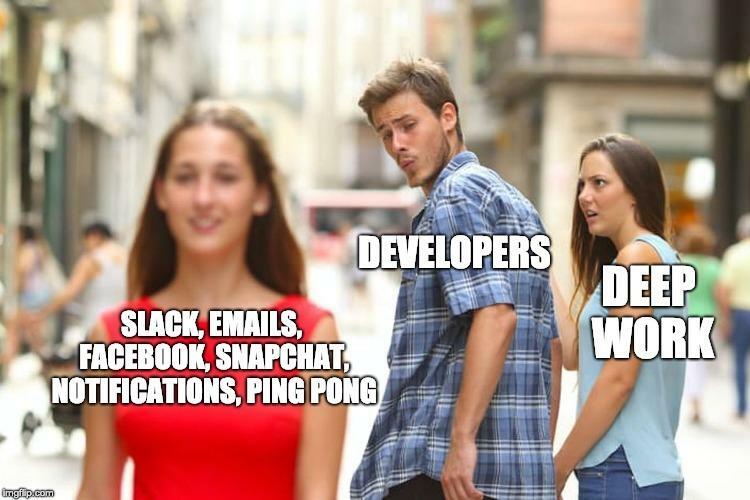 Alerts, emails, notifications, Slack, Facebook, Twitter, Instagram, Snapchat, group texts. So. Many. Distractions. Nicholas Tietz Sokolsky stresses that to produce great code we must get into a state of flow through the practice of deep work, yet all of these distractions make it nearly impossible. So take control of your life and limit distractions, both digital and physical. Get into deep work, embrace flow, and get some s**t done. Having trouble staying focused? You're not alone. Nir Eyal examines some of the science behind our ability to pay attention and how it involves both focusing and ignoring - the latter of which gets harder as we age. To increase focus, we need to boost our ability to concentrate while also limiting distractions and Nir provides some simple techniques for doing both. Definitely worth the read. Workplace culture is important to the happiness and satisfaction of a job. Really important. In this article, Stephanie Buck gives tips to help avoid landing somewhere with a cultural mismatch and what you can do it's too late and you're already dealing with a culture you hate. The folks at Basecamp have been talking a lot about how the typical modern office and ways of working are crazy. One of their consistent targets has been the open office. But, as Jason Fried ironically points out, Basecamp has an open office. Jason explains why open offices make sense business-wise and how Basecamp's use of "library rules" allows it to work for them too. The key is to have a quiet environment that allows focused thought. Check it out for fascinatingly detailed descriptions and pictures of what Basecamp has done to limit noise and promote focus. Don’t Teach Your Kid to Code. Teach Them to Communicate. Ever play those "learn to code" games with your kids? Well, they may not be giving your child as much of a leg up as you'd hope. Greg Satell describes why most of what students learn in school today will no longer be relevant when they graduate college. The job market and technology will change so much in the next 20 years that developing the ability to learn and adapt will be much more critical than any given subject or field. Additionally, learning to use empathy to work and communicate with other humans will be equally critical and a competitive advantage over our future AI counterparts. If you have kids or think you may someday, check it out.